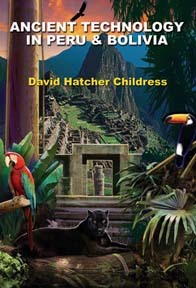 David Hatcher Childress, popular Lost Cities author and star of the History Channel’s long-running show Ancient Aliens, takes us to the mysterious ruins in the mountains of Peru and Bolivia in search of ancient technology and the secrets of megalith building. In his new book, packed with photos and diagrams, Childress examines the amazing stonecutting at Puma Punku, a site neighboring the ancient ruins of Tiwanaku near Lake Titicaca in Bolivia. He looks at whether the so-called “Inca walls”—found in Cuzco and at other sites such as Sacsayhuaman, Ollantaytambo and Machu Picchu—were really made by the Incas. The evidence seems to support the idea that they were actually constructed by a far older culture. Childress examines the megalithic construction and underground chambers of Chavin in the Cordillera Blanca of Peru, possibly the oldest megalithic site in South America. He also speculates on the existence of a sunken city in Lake Titicaca and reveals new evidence that the Sumerians may have arrived in South America over 4,000 years ago. Childress demonstrates that the use of “keystone cuts” with metal clamps poured into them to secure megalithic construction was an advanced technology used all over the world, from the Andes to Egypt, Greece and Southeast Asia. He maintains that only power tools could have made the intricate articulation and drill holes found in extremely hard granite and basalt blocks in Bolivia and Peru, and that the megalith builders had to have had advanced methods for moving and stacking gigantic blocks of stone, some weighing over 100 tons. The incredible high-tech world of South America is illuminated in the informative and breezy style that Childress has been known for in his books and his appearances on television shows like Ancient Aliens. With 16-Page Color Section. ANCIENT TECHNOLOGY IN PERU AND BOLIVIA By David Hatcher Childress. 374 Pages. 6x9 Paperback. Illustrated. 16-Page Color Section. Footnotes and Bibliography.